Cinder, a gifted mechanic, is a cyborg. She’s a second-class citizen with a mysterious past, reviled by her stepmother and blamed for her stepsister’s illness. But when her life becomes intertwined with the handsome Prince Kai’s, she suddenly finds herself at the center of an intergalactic struggle, and a forbidden attraction. Caught between duty and freedom, loyalty and betrayal, she must uncover secrets about her past in order to protect her world’s future. In this thrilling debut young adult novel, the first of a quartet, Marissa Meyer introduces readers to an unforgettable heroine and a masterfully crafted new world that’s enthralling. Firstly, I want to (hopefully) save some readers the confusion and label this book as Syfy-Fantasy-Lite, with a feel on the middle-grade end of the YA spectrum. If I'd looked at it this way up front, I'm sure I would have been in a better mindset to enjoy the read rather than getting hung up on the many scientific and medical aspects that required a suspension of logic/disbelief. Instead it took me until 2/3rds of the way through the book to arrive at this crucial genre and target-audience specification. The cyberpunk fairytale concept is intriguing. In a market flooded by retellings, this twist on Cinderella offers a cyborg grease-monkey heroine with a spitfire attitude and a bad case of technologically-induced amnesia. (Nope...haven't seen that before!) There's no fairy godmother to be had, and the closest thing Cinder has to benevolent animal companions is an outdated, pleasantly dysfunctional android named Iko. But despite the questionably-justified (and minimally explored) suspension of human rights for cyborgs—and the looming threat of an incurable (but vaguely explained) pandemic—this story really doesn't have that gritty dystopian aftertaste. How far in the future the book is set isn't clear. Readers will gather that it's been 125+ years since World War 4 decimated large portions of the population and somehow resulted in a joining together of countries into a conglomerate of six nations—which generally sound like they're based on the six habitable continents. Each resulting nation seems to run its own form of sovereign government—the story taking place in the “Eastern Commonwealth,” a monarchy with New Beijing at its center. There are hints that this is taking place many centuries farther in the future—or perhaps in some alternate version of our reality's future (my personally favored theory). In Cinder's world, characters throw around words like “intergalactic,”and the moon has been long ago colonized by humans who have—through unspecified means—become something both more and less than human. And by “more and less than human” I mean they've turned into a reclusive race of telepathically-manipulative, technologically-superior beings controlled by one uber-vain brainwashing queen who brazenly slaughters all who do or might oppose her sociopathic will. Side Note: I'm not among those who have some huge ethnicity beef with this book. It's set (presumably) so far in the future, I would expect a significant genetic muddling to have taken place by then. Add to that, there seems a deliberate sparseness of physical descriptors for a majority of main and side characters. I'm still not clear on what Prince Kai looked like, aside from black hair and handsome-by-general-consensus. The same goes for Cinder, the two stepsisters, and whatever the stepmother looks like sans makeup. Queen Lavana is intricately described...but this is a touch ironic, considering her appearance is a telepathically reinforced lie. What DID bother me about the whole New Beijing setting was tied to weaknesses in the worldbuilding. The Asiatic references (primarily names, food, and a few iconic props) felt a bit superficial and watered down. But if I look at it from a more fantasy angle, this becomes easier to dismiss. It also helps ease some expectations I initially had for a deeper examination of why Cyborgs (even those with only a small percentage of artificial parts) would be so widely regarded as sub-human. While it seems a lost opportunity to explore the roots of prejudice and subjugation, I expect that would have added too much length and complication to a story that already has a lot going on. Sadly, this reader didn't care much for the hero. Prince Kai came off a bit blasé and weak as far as dynastic future-rulers go. He's kind and well-intentioned, to be sure...but the limited time spent in his head isn't much for helping readers get to know him beyond his title. Handicapped by a seemingly useless adviser and woefully outmaneuvered by his enemy, I kept hoping he'd come up with some hint of cleverness or way of asserting himself outside of sarcasm...but alas, that didn't occur. I suppose there is hope for future books. Without giving anything away, I think I'm safe saying it's a fairly unresolved cliffhanger. Unfortunately it leaves little satisfaction in it's efforts to entice readers into picking up the next book. But on the up side...there's also no Deus ex Machina to be found. Despite my mixed feelings, this is an entertaining book I would still feel good about handing to my 14-year-old goddaughter. The pacing is quick, the writing is effective, and the underlying message is empowering. Cinder is a strong-yet-flawed heroine—one whom readers will be more inclined to root for than pity, despite her backstory. And while there is a romantic angle, it avoids going the hyper-sexualized route and takes a far backseat to the plot. I was just interested enough to pick up Scarlet, the next book in the series. First, I just want to say how much I love the idea of this series. Each book in the futuristic sci-fi Lunar Chronicles is a retelling of a classic fairy tale, and I think that combo is magical. Cinder, obviously, is Cinderella. The sequel, Scarlet, is Little Red Riding Hood. And still to come are Cress (Rapunzel) and Winter (Snow White). Each book will continue the tales of the characters from the prior book while introducing us to new re-imaginings of the fairy tale characters, and while I have no idea how Marissa Meyer is going to pull that off, I'm thrilled about the concept. Now, talking about the book itself, Cinder was a fun protagonist. She was Cinderella meets Kaylee from Firefly, with robot parts. And I liked that although, like the fairy tale, Cinder's romance with the Prince was definitely part of the story, her main motivation was not love, it was independence. Cinder was prepared to pull herself up by her mechanical bootstraps, and I appreciated that about her. Prince Kai wasn't the most fleshed out of characters, although I liked him well enough. No, I didn't fully understand what made him so very appealing to Cinder, but he wasn't unappealing. I just didn't quite love him. But that's okay, since as I said, the love story was not actually central to the plot. I'm okay warming up to Kai over several books while I stay invested in the rest of the plot. Even Cinder ends the book not entirely sure about how she feels about him, so it's all right for me to feel the same way. I really enjoyed the way the fairy tale elements were woven into the story. There's still an evil stepmother, and an evil stepsister. There's a prince, and a ball. And there is the classic running-away-down-the-steps scene, although with a twist. But at the same time, there's an evil queen who rules a race of people who live on the moon, with mind control powers. There's political unrest. There's a mysterious plague. There's androids and hovers and cyborgs. So while it is recognizable as the fairy tale that inspired it, it also brings a lot of freshness and imagination that makes it stand out from the crowd. I will say it's a bit predictable. I called the big "twist" ending somewhere in the first 50 pages. But it didn't lessen my enjoyment of the book. I still loved to see how everything unfolded. The thing with fairy tale retellings is that we already know all the bones of the story, so I don't think a surprise ending is all that important. What matters is the creativity of how the tale is told, and how it differs from the original. The characters and setting and how they can hold my interest, even if I know (more or less) what's coming. And I think Cinder accomplished that in spades. If you are looking for a fun, imaginative new series that puts an exciting sci-fi twist on the stories you grew up with, I'd highly recommend Cinder. After first hearing about this book from our school media specialists, I was intrigued. I had just finished The Grimm Legacy by Polly Shulman and Tales Dark and Grimm by Adam Gidwitz and was looking for another "Fairy Tale" genre book. Cinder's plot line in parts is predictable,which allows the reader to make connections tonth characters. Cinder, cyborg and master mechanic, is a strong minded Cinderella. She has her evil stepmother, her legal guardian, and stepsisters. However, Marissa Meyer adds her own twists. There are threats of plague haunting New Bejing and hundreds of people are dying. People are celebrating over a hundred years of peace after World War IV while trying to keep peace negotiations going with the ruler of Luna(the moon). This book combines the romantic elements of the classic Cinderella tale, with the science fiction of Star Wars, and maybe a little bit of deception. It is a book I would recommend to all my middle school students, male and female alike. There is a little bit for everyone. A great read that keeps you on the edge of your seat. Strong heroine with some elements of a tragic hero. I mostly enjoyed this book. It was simple and easy to follow with so much foreshadowing that it drove me insane. I knew she was the damn princess when it was first mentioned. It was fast paced and I did read it all in one sitting. I was never bored, it that going for it at least. I will say the reasons I had for not wanting to read this series were justified. It's written more like a middle grade novel in my opinion. I also didn't like that she was part cyborg. I'm not really into Sci-Fi. I like only one series that is Sci-Fi. So yeah this was pretty doomed from the start I guess. I will say that I love Kai, I think he's a pretty good character, though he can be a little bit stupid at times. He's an emperor yet he's so quick to bow down to this stupid bitchy Lunar Queen instead of doing everything he can to find a better way. I don't like the end, we don't even get to see what happens to Cinder, I feel cheated, like this book wasn't finished. I think hype is what killed this book for me mostly. EVERYONE loves this series and I'm so heartbroken that I didn't love it too. I love being in these huge fandoms and talking about books I love with others but in this case... I'm sorry. In this retelling of the Cinderella story, Cinder is a cyborg mechanic living in New Beijing. Adopted by a man who died years ago, she is left with her hateful stepmother and two stepsisters. Being a cyborg comes with many tensions and inconveniences, including prejudice from fellow citizens and the cyborg draft, an initiative to help the scientists of New Beijing find a cure for the plague that has devastated the world. Things change when Prince Kai approaches her, asking Cinder to fix his android. What starts as a business encounter turns into something more as Cinder faces new struggles and learns of hidden truths that could change everything. I was intrigued by this book's high ratings and seemingly endless praise. I finally decided to pick it up, and I can conclude that it is one of the most original, enjoyable and riveting books that I have ever read. I was skeptical at first, as stories of cyborgs and androids generally aren't included within my usual reads, but I must say that I agree with all the five-star ratings and raving reviews. The world-building in this book blew me away. I was completely and utterly engrossed in the world of New Beijing, and all of the social norms, prejudices and political issues that revolved around it. I feel that in a way, it mirrors our world: people are quick to judge those who are different (like many judged the cyborgs), people become desperate in hard times (for example, times of illness), and of course, there was the tricky and intriguing world of politics. All of these issues were portrayed in a way that made them seem incredibly realistic despite being dystopian and within the realm of science fiction, and this added a whole new dimension to the reading experience that I feel many books, unfortunately, lack. This was a refreshing retelling of Cinderella. The use of cyborgs and "hovers" and extraterrestrial beings made for an original tale and a nice break from the more fantasy-oriented retellings of fairy tales. Cinder herself was a perfect combination of the traditional view of Cinderella - mistreated, hopeful and pleasant - and an original personality. I hope that readers get to see more of her in the next book! All of the other characters, including the stepmother, stepsisters (one friendly and one not-so-friendly) and the prince fulfilled their roles from the original fairy tale, however the author also went above and beyond to make them unique and much more than just overused, stock cliches. The combinations of the characters, unique twists and the world itself brought the book to life as I read it and I never wanted to put it down! While there were some twists that I could definitely see coming, this didn't take away from the reading experience at all. Any disappointment that came from being able to guess some of the big reveals was erased by the author's writing style. I read it for hours on end without needing to take a break, and the time seemed to fly. I was sad when I flipped to the last page, because I don't have the next book yet! I recommend this to fans of YA and science fiction. Even if you're not a big fan of science fiction, give this book a try! You won't regret it. Not your traditional fairy tale. While the name and basic story line takes you back to your childhood fairy tales, Cinder is far from the pumpkin coach and Fairy Godmother. Unlike the traditional tale, this one takes place in a technologically advanced society. Cinder, part "human" and part cyborg doesn't need a fairy Godmother to take care of her, she manages just fine herself-catching the eye of the prince, even though she doesn't want it. She gets herself into some rather sticky situations...and is resourceful enough to get out of them. Cinder is a cyborg and her stepmother hates cyborgs, you know what that means? Cinder is treated like a slave doing the chores and working as one of the best mechanics in New Beijing just so that she could give all of the money to her stepmother. She's feed up with her life, with the way she's treated like a slave by her stepmother and a nuisance to her stepsister Pearl, the only thing that's keeping her from cutting out her ID chip and running is her other sweeter stepsister Peony and her friend who also works for her stepmother, the perky and stylish android Iko. But then something else occurs the prince disguised turns up to her shop in urgent need of a repair of his android. Cinder like every other girl in Beijing instantly finds her self crushing on the nice prince, who seems to like her as well, to bad he doesn't know that she's secretly a cyborg. Meanwhile a plague has rapidly been taking lives throughout the Earth even prince Kai's own father has been infected, which means that scientist have rapidly been looking for a cure by testing it on cyborgs. And the Lunar's queen, human beings who went to the moon hundreds of years ago and had gained the power to manipulate bioelectricity, has been threatening to start war on Earth if Kai doesn't meet her demands. The only thing that can possibly keep the queen from starting war on Earth is if the possibly alive Princess Selene is found. What tried to kill her? The queen and she'll do anything to make sure she's not found, even wage war faster. Soon Cinder finds herself caught up in these events and finds herself worrying about more things then a wicked stepmother and stepsister. I highly recommend you read this enticing story, I'm glad I finally did! Cyborg Cinderella set in a futuristic Asian society dealing with a ravaging plague and freaky moon people with their sociopathic queen. Cinder is mostly cyborg, and in her world, that's not a cool, awesome thing. Cyborgs are heavily discriminated against and considered second class citizens. Or maybe they're even lower than that. Cinder actually belongs to her evil stepmother, and since she's a cyborg, she's in danger of being pulled to be a guinea pig for the cure to the plague. Note: the cure has not been found yet, which means a lot of dead/dying cyborgs. Cinder's skill with machines grants her the title of being one of the best mechanics in the city, which means that when the crown prince's favorite robot malfunctions, he turns to her for help. With the mystery of a missing moon princess thrown into the mix, Cinder is absolutely one of the most interesting and captivating retellings of the Cinderella story that I have ever gotten my hands on. It's got action, romance (put not really insta-love), clever dialogue and great characters. The plot is solid and deviates from the regular Cinderella story enough to make it extra interesting. Seriously, when I finished it, I was rabid about getting my hands on its sequel, Scarlet. OMG WOW! I have seen a lot of concepts for the Cinderella story. Although most were really good, some were extremely far fetched. I was on the fence about this book when I first read the synopsis, but Marissa definitely got my attention! This book was amazing. I loved how everything played out and the amount of thought and effort she put behind this book. I was extremely happy I picked this one up and gave it a chance. It was a really great book. Meyer has turned fairy tale into a whole new meaning. We meet a cyborg named Cinder who faces the many hardships we saw in the Cinderella we grew up on. There is a Prince whom everyone fawns over, an evil stepmother, two stepsisters, and hard manual labor. Yet, Marissa made this story amazingly different. Cinder has no idea how or why she became a cyborg. All she knows is the injustice she has to face everyday because of what she is. I really liked her character. She seemed so down to earth and just like any normal teenager. She has hopes and dreams and a secret crush on the Prince. Speaking of which, Prince Kai was adorable! Kai has a lot on his plate. He has the loss of his parents and the imminent threat of war against his kingdom and the rest of the world to deal with, not to mention he has to rule as well. I was devastated reading his hardships. I felt that Kai was never going to get a break from the cruelty of the world. He has to also deal with the suffering how thousands as the “blue fever” plague, better known as Letumosis, sweeps through his kingdom. Will he ever find a cure for a disease that has been around for years now? My favorite character was Iko. She is an android and Cinder’s best friend. Her honesty and perkiness was to die for. She was just too cute! I kind of imagined her as Wall-E, just a cleaner, whiter version. She was the comical side of this book for me. Not to mention she was also infatuated with the Prince lol. Cinder and Kai have to each deal with the Lunars in a different but similar way. Queen Levana has become too much to handle, and secrets are unraveling faster than anyone can handle. Although I kind of guessed the bigger secret, it was still a pleasant surprise when push came to shove. I was pissed by Kai reaction to Cinder’s revealed secrets. This added him to my cold shoulder list. I cannot explain further since I do not want to ruin this discovery for you. The most heart wrenching part of the story for me was when Cinder lost two people quite close to her. I was in shock after it happened. I guess when you think of Cinderella you think happily ever after, and that is definitely not what you get with this story. This is by no means a bad thing. I was quite relieved that it took a different turn. Not everything can turn out picture perfect. There is no happily ever after in real life, and what made this story all the more better; the realistic scenarios in the story. I am really eager to read the next story in this series. I hope Scarlet is just as good as this one! 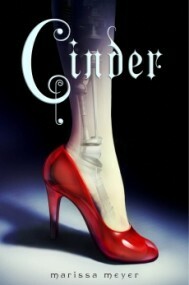 Cinder is a wonderful read that follows retelling pattern of the fairy tale, Cinderella (hence Cinder). We get a robotic twist in this one, where our protagonist, Cinder, is a cyborg. Caught in a terrible fire as a child, Cinder was injured so horribly to the point where surgeons had to replace parts of skin, limbs, and bones with metal parts in order for her to survive. It's great having her life back, but the downside is losing privileges that a "normal human" would have. She's basically treated like dirt, just like the beginning of the tale of Cinderella, and she even lives with two step-sisters and an wicked stepmother. The plus is being a great mechanic--something that's hard not to be good at especially when parts of your body are chunks of metal. Weighed down with the job of being the only source of income for her "family", Cinder really has nothing great to say about her life. When one of Cinder's sisters contracts the cure-less, ravaging plague "letumosis", the blame is put on Cinder by Adri, none other than Cinder's evil stepmother. Looking for any chance to get rid of a burden, Adri hands Cinder over to the New Beijing government to be a guinea pig for letumosis cure testing, in exchange for money. While being prodded at though, scientists find a special secret about Cinder, one she did not know about herself. She is a double-edged sword. She may be the savior to humankind, but if the Lunars (the enemies in disguise) get their hands on her, it could all be over. Besides the plague, New Beijing has the Lunars to worry about--people of the moon hence their name. With their magic of brainwashing and compulsion, they could bend any human to their will and take over the world. The only thing stopping them is the tense peace treaty signed between Earth and Lunars. It's fragile, and deteriorating. I detest these Lunars with all of my heart, and it was a wonderful twist on top of the normal Cinderella story. I think the conflict with the Lunars is what makes this story stand out, because if it was only the fairy tail it'd be pretty mediocre. Without warning, Cinder is thrown into the heart of the Lunar/Earthen problem, where keeping her secret is the utmost priority. The only problem with this book is that since it is a retelling, it is very predictable. I could sense the plot twists and the ending from miles away, so I never felt especially giddy at any point in the book. It is a great read, no doubt, but it isn't particularly suspenseful. I love the world and characters though, and they make up for the so-so plot. I am definitely going to be reading Scarlet, book 2 of the Lunar Chronicles, which is the story of Red Riding Hood told Marissa Meyer style! I absolutely loved that this was set in futuristic China rather than the US like so many other novels are. The author’s descriptions of New Bejing are wonderful. We get plenty of little details that made it easy to imagine. There’s androids, hover vehicles, littered streets, netscreens, and holographic fires. The Emperor’s palace is an amazing mash-up of sleek futuristic technology and ancient Chinese design. Everything is just super imaginative, but not too out there. The characters also had a lot more depth than the fairytale. Cinder is not only mistreated by her stepmother, but she’s also looked down upon by those in society who know she is a cyborg. Cinder tries to blend in as much as possible and earns her keep as a mechanic. Her stepsister, Pearl, is cruel towards Cinder, but her younger sister, Peony isn’t. Even though that strays from the original, I loved that Cinder had at least one person who cared for her. Cinder loves her little sister very much, and I felt so awful when her one ally is taken away by med-droids after contracting the plague. At that point Cinder’s life as she knows it changes forever. Cinder now has to deal with her stepmother’s backlash, since she blames Cinder for her youngest daughter’s illness as well as her husband’s death. It’s no secret that Adri is disgusted by Cinder and wants her gone. Cinder also gets sold off to become a lab rat in order to find a cure for the plague, but her test results reveal a lot of unknown things about her heritage. There’s a bit of a mystery surrounding that, but it was very predictable. However, that didn’t keep me from enjoying it. In addition to the new technology and the swiftly spreading disease, Cinder also covers some of the politics of the time. The moon is now inhabited by Lunars and a peace treaty is needed between them and Earth. However, the Lunar queen, Levada, is a horrible woman! She wants what she wants, and she wants it now! She’ll stop at nothing to gain power and take control of Earth, but Prince Kai does his best to not allow it. Kai has a huge burden to carry, but he still manages to be incredibly charming. Unfortunately, Cinder makes sure to keep him at a steel arm’s length. Cinder is a highly imaginative retelling of Cinderella! It keeps just enough of the original premise in tact to make it recognizable, but it also has plenty of unique features to set it apart. It’s also full of characters that you’ll both love and hate, and maybe love to hate! This book is full of twists and turns for our heroine, but she handles them to the best of her ability. The ending has left me wanting more! Damn that cliffhanger!